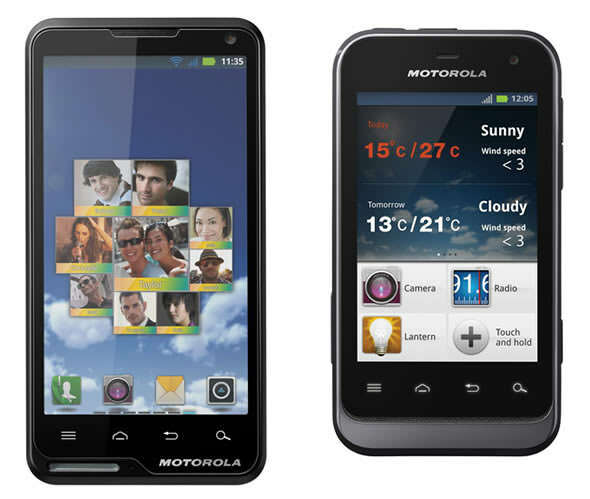 Motorola Mobility has added two new Android smartphones to its lineup, the 4-inch Motoluxe and the 3.2-inch Defy Mini. Both smartphones will run Android 2.3 Gingerbread on launch, though one would hope an Android 4.0 Ice Cream Sandwich update would soon be on the way. The two smartphones will launch in Greater China, Europe and Latin America this spring. 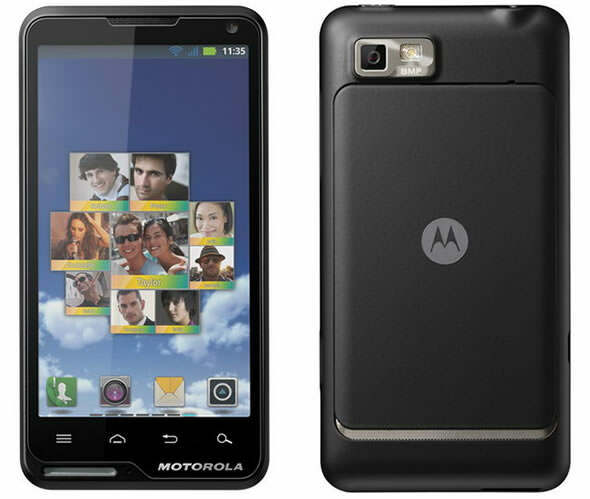 The Motoluxe has a 4-inch edge-to-edge touchscreen (smaller bezels is one of our wishes for 2012) with a 854×480 resolution. It runs on an 800Mhz processor and 512MB RAM. Other features include an 8-megapixel rear camera, a front-facing VGA camera, 1GB of storage, Bluetooth 3.0, Wi-Fi b/g/n, GPS and FM radio. A 1,400 mAh gives up to 6.5 hours of talk time in 2G. The Motoluxe measures 117.7 x 60.5 x 9.85 mm and 123.6g and will come in tasty licorice or white colors. The Defy Mini, as you might have guessed, is the smaller version of the rugged Motorola Defy+ that we’ve reviewed here. Its smallish 3.2-inch touchscreen display with 480×320 resolution is covered by scratch-resistant Corning Gorilla Glass. It’s also water-resistant and dust proof. You only get a 600Mhz processor with 512MB RAM and 512MB of built-in storage. A rather large 1,650 mAh gives you 10 hours of talk time. The Defy Mini also comes with a 3-megapixel rear camera, VGA front camera, Bluetooth 2.1, Wi-Fi b/g/n, GPS and FM radio. It measures 109 x 58.5 x 12.55 mm and 107g. Videos and press release are after the break. LIBERTYVILLE, Ill. – Jan. 5, 2012 – This spring, Motorola Mobility, Inc. (NYSE: MMI) is helping you flaunt your individuality by adding two stylish and unique Android™ 2.3 (Gingerbread) powered smartphones to its growing budget-friendly portfolio. MOTOLUXE is a hip, slim touchscreen device and Motorola DEFY MINI is dustproof and water-resistant, making it the ideal “life proof” phone for active users. And they come in different shapes, sizes and colors – so you can choose a phone that best reflects your personality. No matter what device you choose, Motorola’s MotoSwitch user interface changes the way you manage your life. With MotoSwitch, your smartphone learns who you talk to and which apps you use and keeps all of that information front and center. The Social Graph feature gives you easy and fast access to the people who really matter. It learns who’s most important to you and uses that information to populate the home screen. The more frequently you communicate with someone, the bigger their icon becomes. The Activity Graph gives you quick and easy access to your favorite apps, automatically changing to reflect the apps you use the most. With Music Now you can easily play your favorite music while the Smart Gallery displays your favorite pictures as collections. With Google Mobile™ services you’ll be able to search for anything with Google Search™, chat with your friends using Google Talk™, or find your way anywhere you want to go with Google Maps™ with navigation. The ultra-vogue, very-slim, MOTOLUXE sets the bar high in terms of style with a 4-inch edge-to- edge touchscreen display. This hip device is perfect for writing emails, surfing the Web and watching movies. And, for the amateur photographers out there, the 8-megapixel autofocus camera with flash lets you shoot like a pro and capture life clearly and fully. MOTOLUXE also sets itself apart with a lanyard slot that has a lighting effect. So you can see when you’ve missed a call, received a text or have an email waiting for you. Water-resistant, dust-proof and with a scratch resistant Corning® Gorilla® Glass display, Motorola DEFY MINI is the ideal smartphone for active users who need a device as resilient as they are. With a 3.2-inch touchscreen good for emailing, texting and browsing the Web, and a long battery-life, you can keep this phone on and by your side all day long no matter where you go, so you’ll never miss a beat. 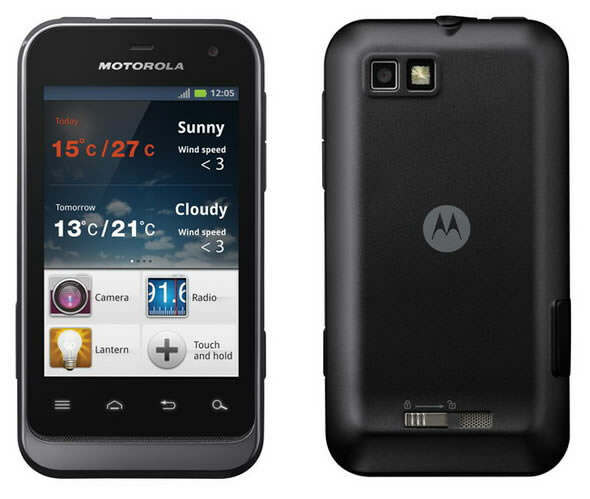 You can get your hands on MOTOLUXE and Motorola DEFY MINI at Motorola’s booth (LVCC, Central Hall, Booth NO. 8644) at the 2012 International Consumer Electronics Show, January 10 – 13, 2012. Both devices are expected to be available in Greater China, Europe and Latin America starting this spring. MOTOLUXE is already available in China under the name Motorola XT615 and is expected to be available in Greater China, Europe and Latin America starting in February. Motorola DEFY MINI is expected to be available in China under the name Motorola XT320 and in select countries in Europe and Latin America starting in February.